Hello fellow cardsmiths, and welcome to Charming Cardsmiths! Last year I made a contest that was based on making cards for cardsmiths, and many people participated in it and enjoyed it. I was sad to see it end, and I always wanted to return to the idea, just with a different approach the next time I did so. So, in this challenge, I would like you guys to create Charms for fellow cardsmiths. 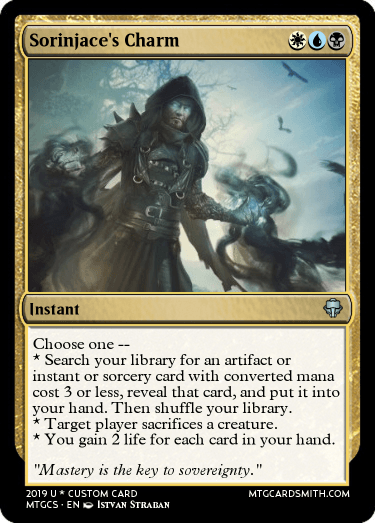 Charm cards generally are two drop instants and have three options that you are to choose from when you cast the spell. 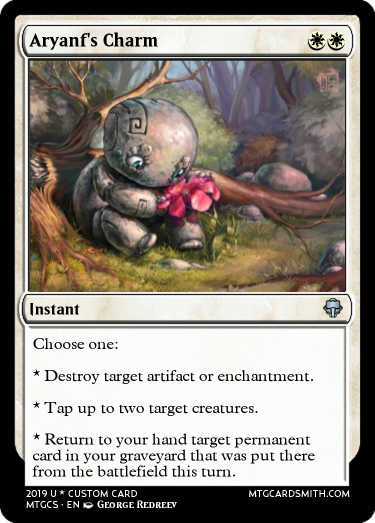 So now cardsmiths, I invite you to create a Charm card that can be for yourself or a buddy on cardsmith that you feel to the best of your knowledge would suit that cardsmith's known or current playstyle or personality! If you are unsure of what to put on the card, it generally helps to visit that cardsmith's profile and see what types of cards they create, this can give you a good idea of what they are interested in or may enjoy playing! Let's charm the hell out of our fellow cardsmiths by making them a Charm card! 1.) Cards MUST be Charm cards. They MUST have Charm in the name of the card, or it won't count. That doesn't mean you can't be creative, the cards in this contest won't have to be exclusively instants, if you can find a creative way to make a Charm card without it being a Instant, go for it! 2.) Cards MUST be dedicated to a cardsmith, even if it is to yourself. Therefor, something recognizable in the name of the card to the cardsmith the card is made for must be in it's name somehow. For example, if you want to make @Corwinnn a card, you can have it be named Corwinnn's Charm, or Squirrel's Charm since he is recognized as a squirrel (or a fan of squirrels.) If you don't put the cardsmiths name in the name of the card, please put who the card is made for in the comment section on the forum and on the card so the cardsmith knows you made it for them. 3.) Nothing offensive. I will report it or someone else will, no questions asked. 4.) No maximum amount. Go nuts, and have fun! 5.) Old cards are accepted. 6.) Credit the artist please. 7.) End of contest tbd, or depending on the interest in this contest by you guys, the cardsmiths that make this community what it is! Prizes will be determined depending on how long the contest runs. It will all come down to the participation of cardsmiths! I will be updating this as well as the rules (if need be) as the contest continues. Fun idea. Nice job, @sorinjace! Thank you @Faiths_Guide! I hope to see some very cool "Charm"ing cards come from this contest! You got me "charmed" on this! awe @Bowler218 well, your a charming kind of fella! :) It'll definitely be interesting to see what you come up with for this, and who you make the card(s) for! I am known to be rather charming. Don't forget all the 1-drop and 3-drop Charms. But, yeah, all three mode Instants. May I do a two mode sorcery? 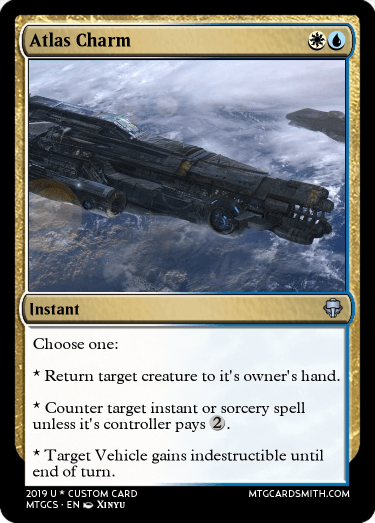 @sanjaya666 that card is awesome! Thank you! @KorandAngels, wasn’t the point to make things for others? Ok, I did my own first. Little tip if anyone does one for me: make it complex, REALLY complex. 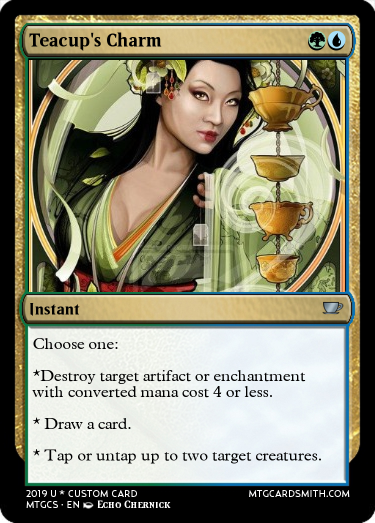 "Cards MUST be dedicated to a cardsmith, even if it is to yourself." You want me to do you next?